Give it a home! Wear it this weekend! Let me live vicariously through you! I've got a wedding to go to and I'm taking two maternity dresses and the Forever 21 black maxi, because at the rate my body's changing, who knows what will fit best on Sunday morning? Or fit at all? So buy the nautical dress for me and slink happily round town one weekend night. And speaking of happy, how perfect would this dress be for a fun-filled night in the city? 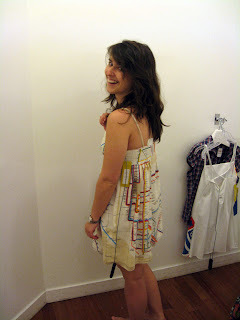 Vintage subway map dress, graciously modeled by Kati. Maybe you'll have a little too much fun and will need some help on the subway. You can just check yourself out for a bit and get your bearings. Not to mention, this dress is a total conversation starter. And think of the party games that could ensue, like "Where's my subway stop?" Francis subway dress topper: the crest vest. I love this vest. Francis flag dress topper: trompe l'oeil pocket square jacket. I also love this jacket. And it has whimsical buttons. Many thanks to gorgeous blogger WendyB for the heads up. She told me his line was at Macy's after I raved about the safety pin skirt. And many thanks to my gorgeous model, Kati. Doesn't she have the perfect happy disposition for Francis? Be sure to go here before you shop Macy's and get the Memorial Day Weekend shopping pass for an extra 10%- 15% off clearance items. Okay, descending from orbit and going gaga over *both* dresses Miss Fashion, the nautical is simply TDF and the vintage subway? Equally incredible! Hope you have a wonderful weekend with Mr. Fashion! Wendy - what's more cute, the dress or Henry looking at the dress??! Tough one! TP - No, Francis couldn't be more fabulous! Well said, totally TDF! cute dresses... have a wonderful weekend. Hi there-I so love the subway dress, its gorgeous, Kati is a lovely model! I love that flag dress! It is so cute...I would totally wear that. And OMG...I did not know that you and WendyB knew each other IRL!!! How cool are y'all!!!! Wow!!! My, I really like the print on it!! !